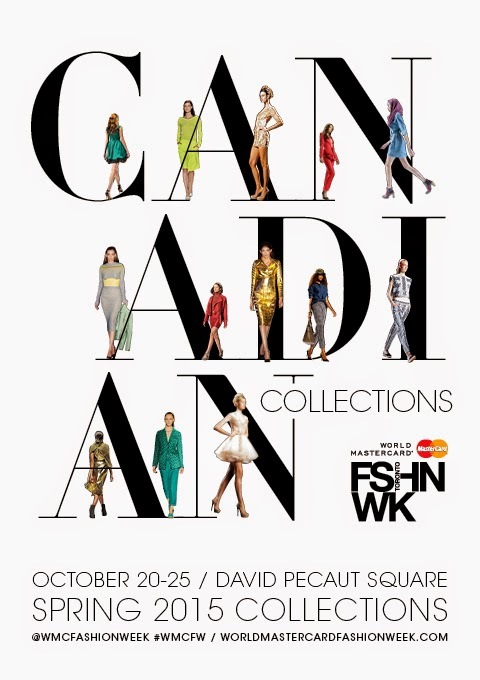 IMG has announced the details for the World MasterCard® Fashion Week Spring/Summer 2015 Collections event, taking place at David Pecaut Square in Toronto from October 20 to 25. The current list of designers participating this season is available online, and includes Brit Wacher, Bustle, Caitlin Power, Christopher Bates, Elan & Castor, Hayley Elsaesser, HD HOMME, Hillary MacMillan, HUNTRESS, Klaxon Howl, Joe Fresh®, MACKAGE, Madame Moje, Malorie Urbanovitch, Matthew Gallagher, Mélissa Nepton, Mikael D, Mikhael Kale, Pink Tartan, RUDSAK, RUDYBOIS, SOIA & KYO, Sid Neigum, Stephan Caras, TARGET, Thomas Bálint, Threshold featuring Rani Kim and Som Kong, as well as the Mercedes-Benz Start Up group finale show featuring 2014 finalists Beaufille, Laura Siegel, BLAK.I, VAIKEN, Eliza Faulkner and Sid Neigum. Fashion Saturday presented by BMO will return for another season on Saturday, October 25 and will offer the public an inside look at Canada’s leading fashion week. Hosted by actor and host Lauren Collins (session one) and Cityline host Tracy Moore (sessions two and three) guests will enjoy a special Spring/Summer 2015 highlights fashion show featuring top Canadian designers, followed by a trends presentation with style expert Afiya Francisco, Maybelline’s Grace Lee and Redken’s Cindy Duplantis. Attendees will also be able to shop the designer pop-up market, experience the Fashion Environment, participate in hair and makeup installations, sample VIP-style food and drinks and much more. Tickets to the three sessions (1 p.m., 4 p.m. and 7 p.m.) are available for purchase online. Student rates are also available. “We're very excited for the Spring/Summer 2015 season of World MasterCard Fashion Week, and continuing to host Canada’s top fashion week. We have some incredibly talented new designers showing this year and our special Fashion Saturday event is back, offering the public an insider’s look at fashion and trends for spring 2015,” says Carolyn Quinn, director, IMG Fashion Canada. World MasterCard Fashion Week at David Pecaut Square in Toronto will host more than 30,000 guests throughout the week, and designers will showcase their collections in the runway venue, hosting 800 seats or the intimate studio space, a presentation room that can be customized unique to a designer’s vision. Press and Industry accreditation is now open online, and will close on Friday, October 17.